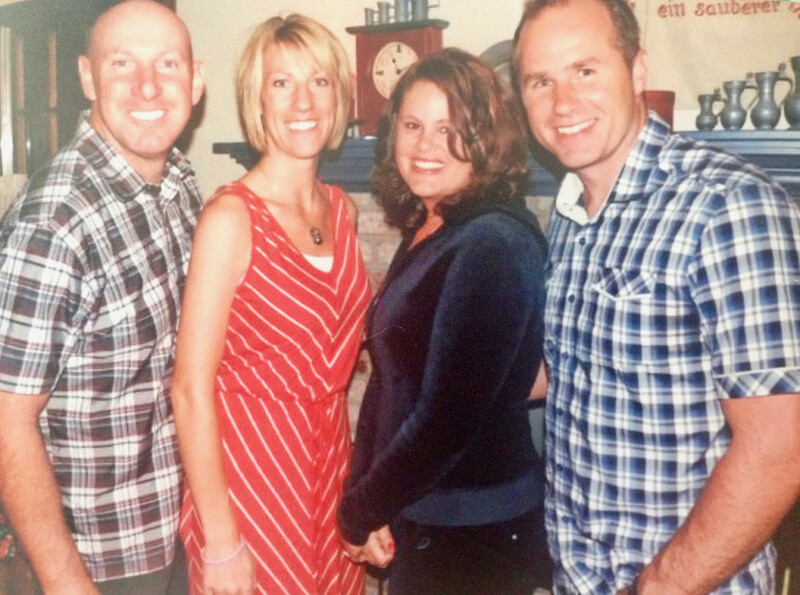 Just because two sets of parents are good friends doesn’t mean their offspring will follow suit. So was the case with Chelsea and me. 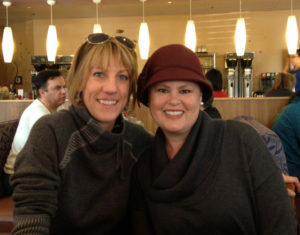 We saw each other every summer at Mount Hermon and ran through camp together while our parents hung out and caught up. It took 358 days to bring us together again, and we continued that pattern through childhood and adolescence. 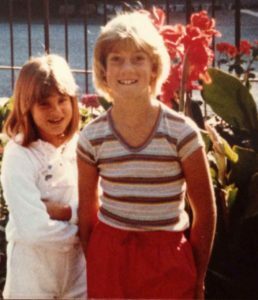 I’m writing a book for a woman about grit and resilience. Besides living in another country for 12 years, I haven’t had many events or occasions that forced me to dig in and claw my way out. And in a weird way, I feel bad about that. People who get dragged through sludge and dropped off face down earn stripes that seem admirable. Commendable. Honorable. Me? My first 20 years consisted of a stolen bike, a few car accidents, a black eye, and a broken heart. My next 20 included a miscarriage, a dozen years south of the border, a stolen catalytic converter and a few friends who went AWOL. Sad for me, but not exactly the trauma some deal with on the regular. God promises us we will have trouble in this world though, so I figure ‘grit’ and ‘resilience’ aren’t bad things to entertain. For years I’ve felt like I’ve been on the edge of something tragic, so a little pre-traumatic growth couldn’t hurt—might help. In an effort to educate myself more about the topic and become a better writer, I’m reading a compelling new book called Option B.
I read the line over and over. How do I process negative events? The older I get, the more they show up. Money vanishes, our teeth start rotting out of our skulls, and people die. Don’t bother assuming I compare the three; just because I squished them together in the same sentence doesn’t mean they’re equal. But after I typed that I realized they do have something in common: Chelsea. 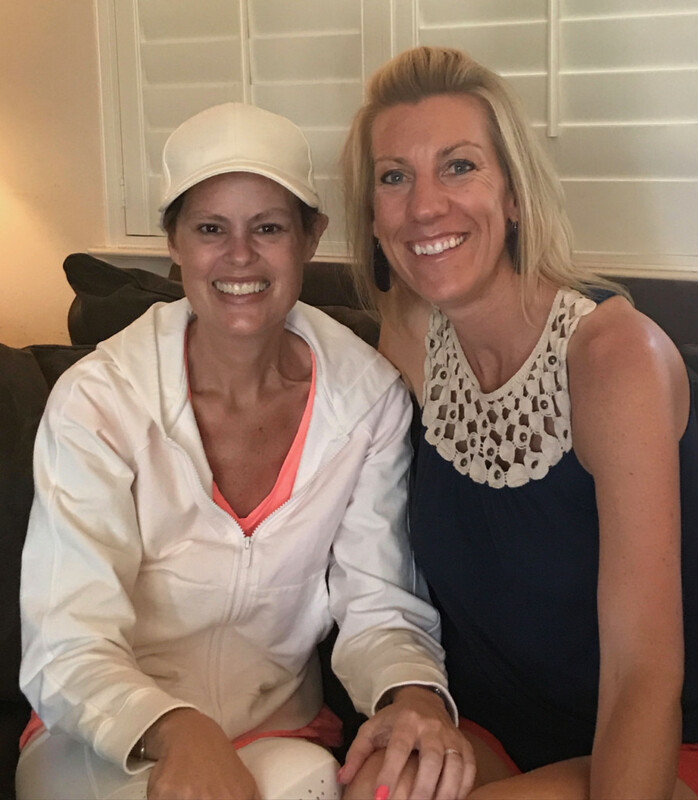 About eight years ago God brought us back together again, right around the time she got diagnosed with stage-four breast cancer. Her valiant battle jerked her through biopsies, MRIs, scalpels, drugs, dental surgery, radiation, new tumors, the Cyberknife, and chronic pain. We drove and ate and walked for hours. 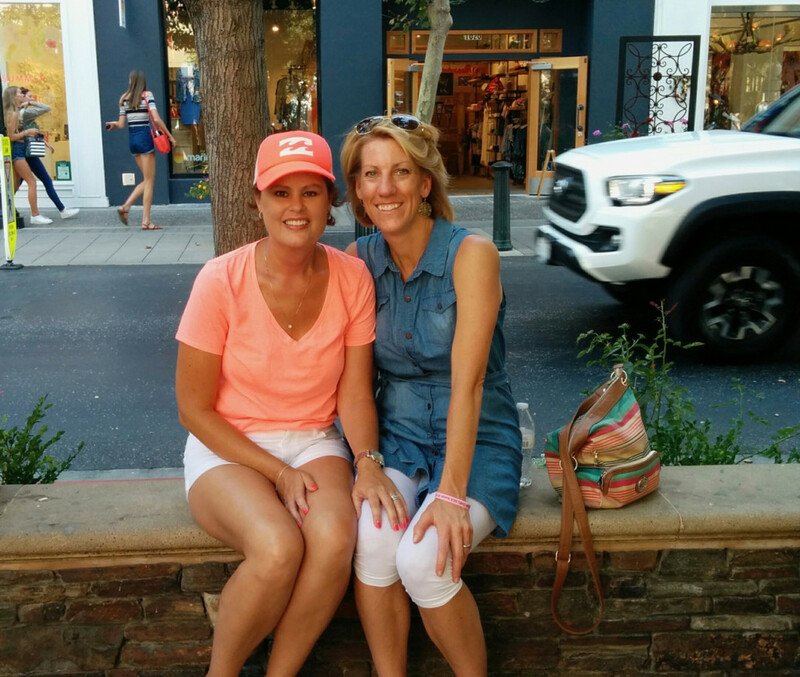 New prayers, old restaurants, and great cell signals from Baja to Los Gatos kept us linked. She made it to 42. That was it. Blew out the candles, took a turn for the worse, and met Jesus face-to-face. How I miss her face. 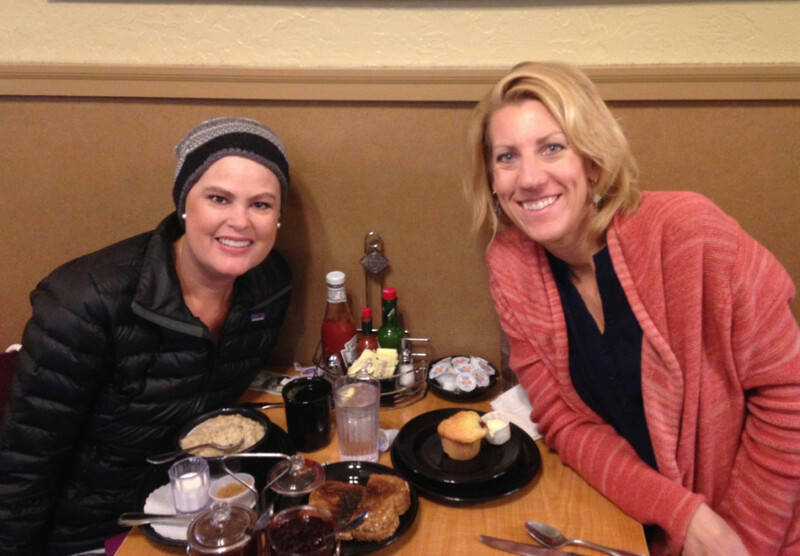 Even in the midst of nasty drugs and bleak diagnoses she always wore a smile. Optimistic but honest, we shared similar struggles, rolled our eyes about female issues and laughed about similar annoyances. Have you lost a soul sister? A faithful friend? A son who shared your blood? I’m sorry if you’ve had to walk that road. It never seems right or fair. For my 40th birthday, Chelsea sent me a huge candle embedded with real apples and cinnamon sticks. The perfect autumn scent permeates the room with memories of my brave friend and makes me miss her more. I want to burn it to remember her as much as I want to never burn it so it doesn’t fade away. Sorry, not scratch & sniff–just click and drool. For my last birthday, she gave me an incredibly fragrant Coconut Hibiscus lotion. “This is my favorite gift to give,” she said. I want to use it every day because it makes me remember our fun times, especially in the summer. But I also want to leave it alone and make it last for-almost-ever. Are you holding onto a gift from a loved one who’s no longer with you? Strange how things like lotion and candles can bring comfort. Since I’m the proud owner of an archaic phone with limited storage and lame capabilities, I regularly delete old texts in order to save space. I have no desire to delete the last few years of messages we sent back and forth. Pictures of her fingers holding the chapstick I sent her. Marriage questions we tossed back and forth. Prayer requests before going into yet another surgery. Encouraging words, comments, laughs, and devastating news. Again. I constantly asked about her latest doctor appointment and she constantly turned the conversation back to me. 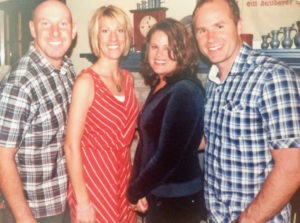 When the evil disease jumped to her brain, she couldn’t remember what she had for breakfast but she continued to ask about our ministry in Baja, Doug’s job, my writing, our move, and our boys’ transition. Do you know someone who’s outward-focused? They could be in between barfing and napping, but they still want to know how you’re doing. Incredible examples of selflessness. I want to be like her. The last time Chelsea called me her voice sounded hoarse. Cancer attacked her vocal cords and she could only stay on the phone for a few minutes. The last text in our thread came from me, one day before she left this earth. I knew she was fading and there wasn’t much left to say. All the obvious prayers and hopes and what-ifs already whispered their way in and out of our conversations. On my weekly prayer calendar, Tuesday equals Health. I add and subtract friends and family every few months based on what they’re going through, praying for healing and endurance on their individual journeys. For the past seven months, I’ve left Chelsea’s name sitting there on Tuesday. Crossing it off my list seemed too sad. Too permanent. Too cruel. I know I don’t need to pray for healing anymore… her body is more perfect and whole than ever. So I deleted her name. Seven letters of ink on a piece of paper that make me smile and cringe all at the same time. She’s been promoted. From Tuesday = Health to Thursday = Thanks. And there she’ll stay till I’m old and gray… safe and sound in the thankful category. The loves in our lives will never truly be deleted. We may remove their names from insurance policies and prayer chains, but their voices and memories live on and on and on. 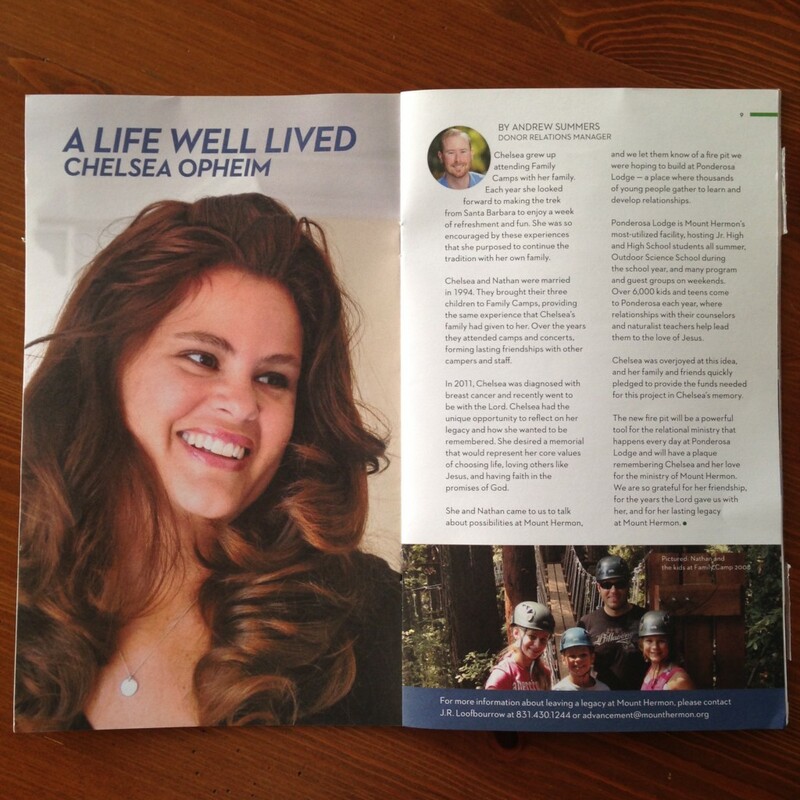 Mount Hermon’s tribute to Chelsea, revealing the plan for a fire pit that will be made in her honor. Have you ever crossed someone off a prayer list? How have you been comforted through that process? Truthfully Carrie, I didn’t want to read this post because I knew the jist of what it was about. While I do not know your Chelsea, I’ve been blessed to have my own “Chelsea” relationships, and I just didn’t feel I could handle reading what you had written, as you have this amazing ability to write in a way that puts people right into your stories. But today I mustered the courage to read it, so thank you for writing in your beautiful, personal style. I too have left people on my prayer list that I was praying for healing who are now with Jesus and I haven’t been able to cross them off. I never actually thought about that being a thing, but it kinda is. So thank you for sharing your heart and I am sorry for your loss Carrie. Thank you for sharing your heart, too, Mandy. I know… losing friends and family members is not fun or easy or fair or right. I love still having Chelsea on my prayer calendar though; right there in the thankful category. Thanks for getting the courage to read my post and then write me. I’m sorry for your losses as well. I didnt know Chelsea but still i cried reading this. What a smile!! It took me years to take my dads name off my contact list in my phone. Hearing the hymn How Great Thou Art and any kind of swing music comforts me. My dad loved that song and he loved to dance. I trust he is eternally dancing and singing in heaven. I have not been invited to that party just yet. Still getting ready for it. Thanks, Susan. Yes, her smile was contagious. I still have Chelsea’s name in my contact list, too. Name, address, phone, email, birthday… all of it. I love how songs and scents bring sweet memories. Hearing How Great Thou Art is a pretty fantastic way to remember your dad. I can’t even imagine what a party that will be! Thank you for writing, for your courage, and the work of writing well. Quite a lot packed in here, Carrie, all of it good and well worth reading. You write your heart. Gracias, William. I appreciate you taking the time to chime in. I too have not deleted Chelsea from …anything. I just can’t. I sit here with tears streaming down my face…deep sadness of missing her and wishing for more time. That is the opposite of how she would want me to feel. To be so in love with Jesus, that she could weather such a storm and leave such an incredible mark on so many people is more than anyone can hope for, right? Isn’t that one of the most common things that people wish for, that their life would have meaning, that they would touch people’s hearts, that somehow, the life God had given them would have been used well? 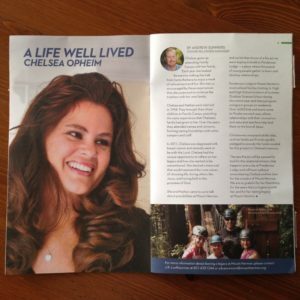 Sweet Chelsea did all that in her kind, truthful and powerful way. What a gift of knowing her and calling her friend. girl, and I give thanks that she is dancing with Jesus. 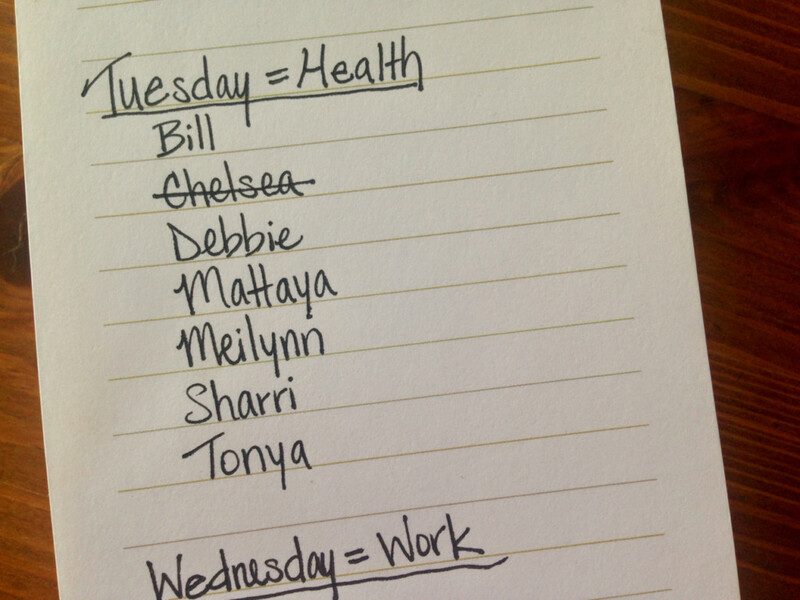 I think it’s perfectly fine that you haven’t deleted or crossed out Chelsea’s name from anything. Everyone needs to go at their own pace and do what feels right to them. Even though I moved her name from “Health” to “Thanks,” I still have zero desire to delete our texts. Yes, you’re right… she weathered such a storm and still left such an incredible mark on so many people. A true light in this crazy world. She most definitely lived a meaningful life! Thank you for your heartfelt words, Charlotte. Doesn’t surprise me one bit that Chelsea reached out and got reconnected with you. That’s exactly how she was: outward-focused and beautiful. How exciting to think about the day we get to see her in Heaven. I can’t wait to hug her neck!